Riding a bike in the city is hard enough, but riding at night can be all kinds of dangerous. There are lights that you can attach to your handlebars, lighted gloves that you can use to signal turns, and even a smart backpack that will alert motorists to your presence and intentions. But the DORA helmet concept from designer Balázs Filczer combines all of these concepts and makes them even better. 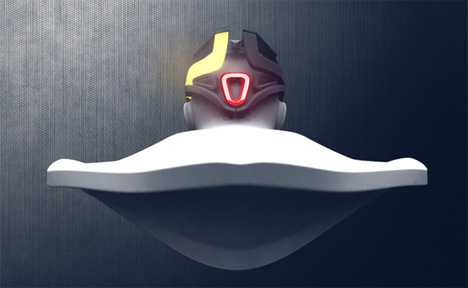 The helmet contains lights from all angles. Turn signals adorn the sides so that when you’re about to make a turn everyone around you knows to get ready for your move. A light in front illuminates your path wherever you go, even when you aren’t riding your bike. The rear light is your brake light, as you might expect. This and all of the lights on the helmet are controlled via a small Bluetooth control on your bike’s handlebars. 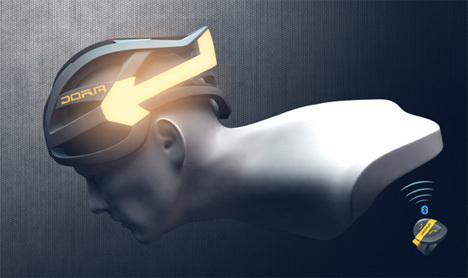 Atop the helmet, a rechargeable battery powers all of the lights. 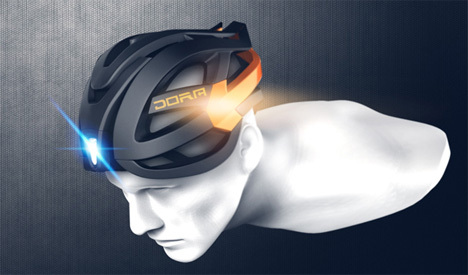 The DORA is a remarkably intelligent helmet that could save countless lives by reducing the top reason for car-on-bike accidents: low visibility. See more in Bikes & Cycles or under Transportation. May, 2013.